Critics pounced on the study, which was published in 2012, because it didn't adjust for many other things that affect IQ such as home life or family income. And there's no proof the IQ differences are due to pot. One of those critics, Nicholas Jackson, now a senior statistician at the University of California, Los Angeles, wondered what would happen if he could rule out some of those elements by comparing twins. "Individuals that share the same genes, grew up in the same household, where the difference between them was that one of the twins was using marijuana and one was not," Jackson says. Jackson and Joshua Isen, now an assistant professor of psychology at the University of South Alabama, conducted a study comparing IQ tests of twins age 9 to 12, before either had smoked marijuana, and then seven to 10 years later, after one had started. "If marijuana was causing IQ decline, what we would expect to see is that the twin who goes on and uses marijuana should have IQ deficits," Jackson says. "We don't find that." IQ scores for both twins varied slightly over time. And for twins who smoked marijuana, there was no significant difference in effect between daily and occasional use. So was the New Zealand finding wrong? The authors did not comment for this story, but have said that the twins study of teenagers does not address the effects of decades of heavy marijuana use. Marijuana seems to affect a particular kind of intelligence, like short term retention of vocabulary words and other information that you might learn in school, says Mitch Earleywine, a professor of psychology at the University of Albany. "They haven't learned a whole lot of vocabulary words or they never learned the capital of Maine because they were high at school that day," he says. "But when it comes to things that are more liquid intelligence, more fluid intelligence, they're usually pretty good at those because it requires just intelligence in the moment, so to speak." It's not clear how marijuana use may keep Augusta from being filed next to "capital of Maine" in the brain. Some studies that compare brain scans of teenagers who use marijuana to those who don't show thinner, less dense connections between lobes. Nora Volkow, director of the National Institute on Drug Abuse, says brains with less connectivity don't work as well as they should. "You could expect that that will decrease your capacity to memorize things and to learn them which is necessary to you to actually further develop your cognitive abilities," she says. Volkow says there's little proof that marijuana causes poor brain connections. Studies so far have not compared brains before and after pot. Maybe kids who are already having trouble in school are more likely to try marijuana. Still, she is convinced that marijuana is bad for the brains of adults who began smoking in their youth. 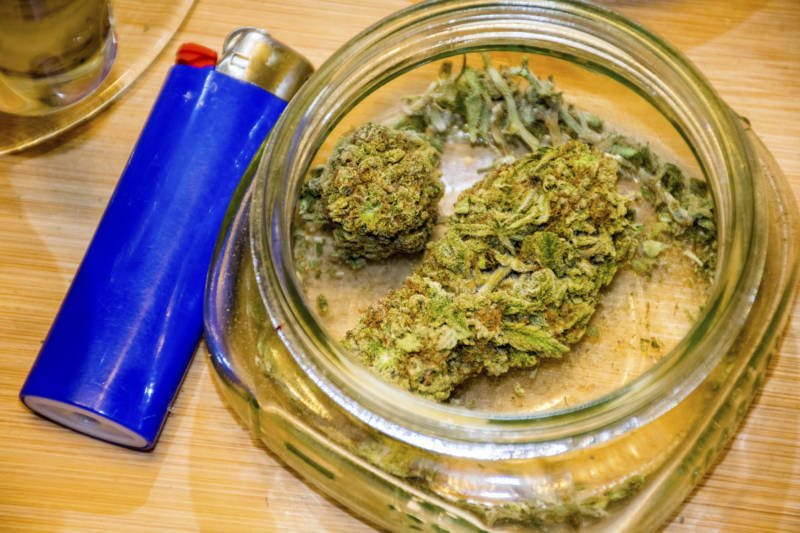 People who regularly smoked marijuana as teens, "are achieving much less both in their education as well as their profession as well as their economic earnings," Volkow says. "They also tend to be much more dissatisfied with life. Many studies have shown that." But as of now, the research suggests if you don't start young and don't use marijuana often, there's not much evidence of permanent harm to the brain. That's led some experts in marijuana brain science to say it might be OK to make pot legal, with strong oversight. That includes Kevin Hill, an assistant professor of psychiatry at Harvard Medical School. "I'm not sure how I would vote [on the Massachusetts ballot question] at this point. I want to see sensible marijuana policy that works, that gives people what they want while limiting risk," says Hill, who wrote Marijuana: The Unbiased Truth about the World's Most Popular Weed. Massachusetts is one of five states, including Arizona, California, Maine and Nevada, that will vote in November on legalizing recreational marijuana.